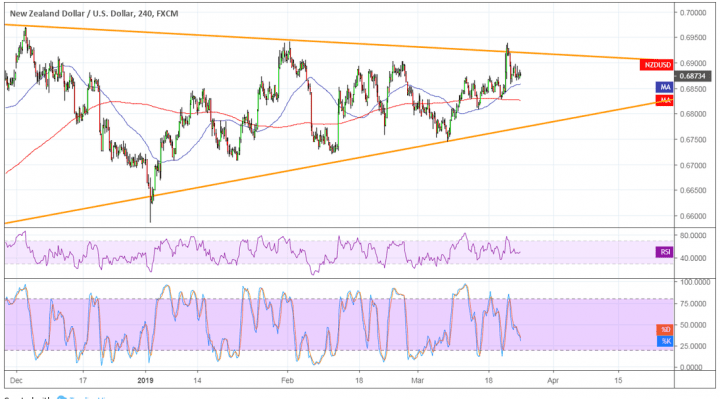 NZDUSD Ready for a Triangle Breakout? NZDUSD has formed higher lows and lower highs to consolidate inside a symmetrical triangle on its 4-hour time frame. Price is currently testing the resistance and might be due for a dip to support next. The 100 SMA is above the longer-term 200 SMA to indicate that the path of least resistance is to the upside. In other words, resistance is more likely to break than to hold. The moving averages also seem to be holding as dynamic support levels as well, although they also appear to be oscillating to reflect current consolidation. A break past the .6900 major psychological mark and triangle top could lead to a climb that’s the same height as the triangle formation. RSI is turning lower, however, to reflect the presence of selling pressure. Stochastic has made it below the center line, also reflecting bearish momentum that could take NZDUSD back to the support around .6800. The RBNZ monetary policy statement is coming up and traders are eager to see if the central bank has shifted its policy stance. Most of its peers have been paring their hawkish rhetoric to account for risks to global growth and ongoing weakness, but the RBNZ has already had a cautious tone ever since. Any shift to a more dovish stance could mean more pain for the Kiwi while reassuring remarks could allow it to hold its ground. Keep in mind that the Kiwi has been able to weather the risk-off flows last week as it also took advantage of dollar declines. There are no major reports due from the US so risk sentiment could be the primary driving factor for the currency. Trade talks are set to happen this week, so positive developments could spur strength while more tensions could drive it lower.